It was the dawn of the space age. Gagarin, Titov, Shepard and Glenn were forging a pathway to the stars. At Bell Aerosystems in Buffalo, New York, a small team of rocket engineers headed by this unassuming genius named Wendell F. Moore was paving the way towards flying free. 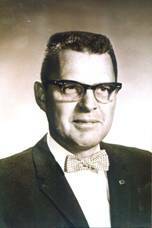 In 1961, a tall, crew cut engineer sporting eyeglasses and an ever-present bowtie from Canton, Ohio would turn that dream into reality. 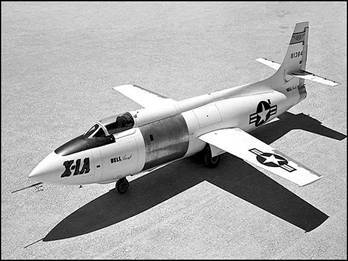 Moore had been part of the engineering team that worked on the X-1, the rocket plane that allowed Chuck Yeager to break the sound barrier back in 1947 as well as the subsequent famous experimental rocket planes X-2 and X-15. Now, Moore was applying his knowledge and experience to constructing a rocketbelt, just like the one in the Buck Rogers comics. Bell Aerospace X-1A and X-2 Rocket Planes that broke the speed of sound. 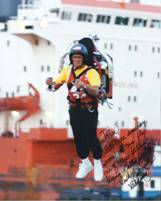 The device weighed 125 pounds and was harnessed to the pilot’s body with a form-fitting fiberglass corset and safety belts. Once tethered for safety to an overhead beam, these “rocketboys” as they were called, slowly began training to become real “rocketeers”. The idea of individual rocket propulsion was not new. But, it wasn't until Wendell Moore and his rocket-team had ironed out the kinks inherent in the man-rocket combination, during the second phase of the program one year later, that a Bell Aerosystems’ pilot would have the opportunity to fly unencumbered. 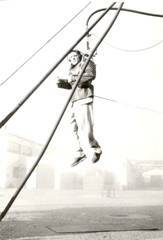 During the first few months of tethered research and development at Bell, inventor and chief engineer Wendell F. Moore personally strapped himself onto a number of experimental rocket rigs. One such rig had a flexible hose draped over a 15-foot-high support that delivered high-pressure nitrogen to tubing above and behind his head. Inventor Moore tries out his nitrogen test rig. 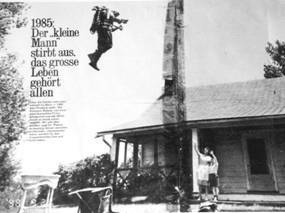 The data from those first flights established that man was not a very stable flying object. One day while he was testing the rocketbelt, simulating Superman's horizontal flying position, a cable snapped and Wendell took a spill; and injured his kneecap, permanently grounding him. The call for a volunteer must have sent images of Buck Rogers and Cody through the minds of the remaining project’s staff. Working at Bell Aerosystems and in his twenties, a 6' 2" ice-hockey player in perfect physical shape; engineer Harold Graham, was selected as a potential replacement for Moore. Wendell Moore looked him over, said "yes," and Graham was on his way to becoming the first man to fly a rocketbelt solo. Gradually, he familiarized himself with this unpredictable and volatile machine. Rocket-riding handbooks didn't exist; the team and pilot created flight procedures daily through trial and error. The first tethered flights inside an aircraft hangar were mostly an assortment of erratic bobbing and weaving motions. After 36 tethered flights, Graham finally bridled Wendell's bucking miniature rocket. They had finished debugging lift-off, flight and landing procedures. For comfort, pads and supports were placed under the pilot’s arms and at his waist and abdominal area. 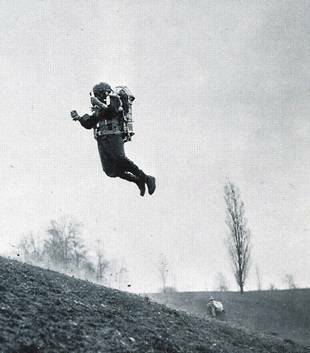 Though technically ready for flight, the rocketbelt was still an experimental flying machine in its rawest form. There was no way of actually knowing if it was really going to fly or crash and burn. To mount the rocketbelt, one would slip the arms through padded lift rings and then secure the unit with two quick-release belts around the abdomen. Two metal tubes, attached to the lift rings, extending forward on each side terminated into two handles. A control stick on the left tube permitted to change flight direction. A motorcycle-type hand throttle on the right allowed the pilot to regulate rocket thrust levels, thus controlling the rate of climb. A throttle-propulsion system forced hydrogen peroxide under pressure into a gas generator, where it mixed with a silver catalyst and decomposed into steam. As the steam escaped through the rocket nozzles, it accelerated to 300 pounds of thrust directed towards the ground. The amount of fuel the belt could carry only allowed for 21.5 seconds of actual flight time. Anticipating the many distractions the pilot might face, and the possibility that they might run out of fuel in mid-flight, the engineers designed a vibrating fuel indicator. Placed behind skull, it would vibrate when the fuel was low, signaling to begin the descent. The day arrived; April 20,1961, on a taxiway at the Niagara Falls International Airport. 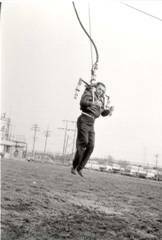 Having trained for months on a tether, Wendell and his pilot Harold Graham were ready to meet the challenge of flying free: the successful operation, flight and landing of the first rocket-powered maneuvering unit. But this flight would be different; it would be untethered. The ground crew characterized Graham as "office-pale and slide-rule slender," referring to dark Clark Kent, Superman's alter ego in the comic strips. The time had come to sling on the twin jet cloak and give life to the comic book heroes of yesteryear. The rocketbelt team had prepared for any eventuality and stood vigilant. A quick test blast, a deep breath, and Graham was ready. With a full turn of the throttle, the rockets strapped to his back roared ferociously. The cold temperature turned the fiery exhaust into steam-like fog. “I couldn't even see my feet”, Graham later recounted. Rising slowly, he pressed down on the control arms, which thrust him forward, and landing safely at touchdown point one hundred and twelve feet away—eight feet less than the Wright Brothers had flown at Kitty Hawk. The flight captured the public's imagination and coincided with the first flight of man in space. Graham and Moore traveled the world demonstrating the rocketbelt and its potential applications in tactical missions, commuter use, and outer space. The need for man to maneuver about in space or on a planetary body was becoming, increasingly clear as humankind's dream of space travel became a reality. In those early days of testing they could only imagine what it would be like for the astro-traveler. Posters and Magazines advertisements of the era, of worldwide fame. Graham’s most memorable flight was for President John F. Kennedy at Fort Bragg in October 1961: rocketing 200 feet away from an offshore amphibious vehicle, he landed in front of him, stood at attention and saluted. With his red hair, Kennedy stood out in the crowd; he looked amazed, wide-eyed and open-mouthed, just like a kid. The public's interest in rocketbelt demonstrations, a glimpse of how man might one day maneuver through air and space, continued into the late '60s. Rocketeers Peter Kedzierski, Robert Courter, Gordon Yaeger and William Suitor --the only one still flying today-- continued flying once Graham retired from the program in '62. Bill Suitor, the last of Bell’s Rocketeer and his three decades of flying. In 1964 (L), at the 1984 Olympics (R) and in Texas in 1994 (C). By 1964, they had become world-famous, flying around the Unisphere at the New York World's Fair, Mickey Mouse's Magic Castle and Tomorrowland at Disneyland and in Washington D.C. in front of the White House. 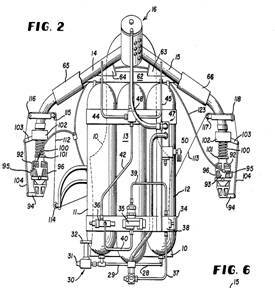 Individual backpack propulsion development continued and in 1969 Aerospace test pilot Robert Courter flew into the aviation history books by piloting Wendell Moore's Jet Flying Belt. Years in the making, the Jet Flying Belt incorporated a Williams International WR-19, the world's smallest fanjet engine. 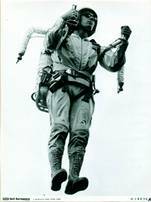 During the '60s the Air Force began soliciting bids for the development and testing of astronaut maneuvering units. 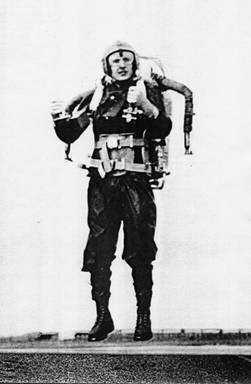 The rocketpack, initially designed to increase a soldier's mobility, became an airborne blueprint for an outer space flying belt. By the late '70s NASA and Martin Marietta had test-flown a rocket-powered backpack aboard Skylab. 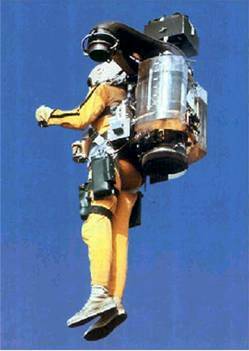 Affectionately named homo-extra-vehicularis, this Automatically Stabilizing Maneuvering Unit was the Manned Maneuvering Unit's (MMU) immediate predecessor. 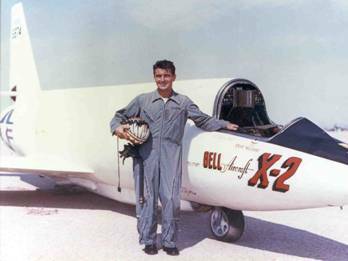 Rocketbelt engineer Wendell Moore, died unexpectedly in 1969 at 51 years of age, shortly after the debut flight of his Jet Flying Belt. 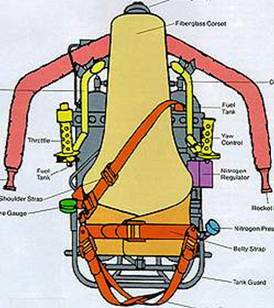 At the time, Moore was developing designs for rocketbelts that could be used on the Moon or in zero gravity. 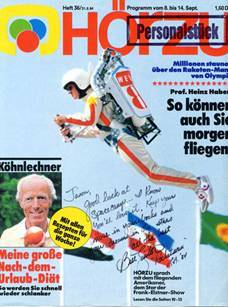 Undoubtedly, had he lived, his designs for manned maneuvering units would have been an integral part of solo space flight.